Nestled in the heart of Hayes Valley, Nurun (formerly Odopod) is one of San Francisco’s premiere design firms. During their start-up days, Conscious Construction was brought on to construct their first commercial build-out, a 3000 sq. ft. office reconstruction consisting of new electrical and data wiring, chic conference rooms, and diamond polishing of their existing concrete floors. Three years later, Conscious Construction was hired to tackle Nurun’s most ambitious construction endeavor to date; the complete rebuild of a 6700 sq. ft. loft space. 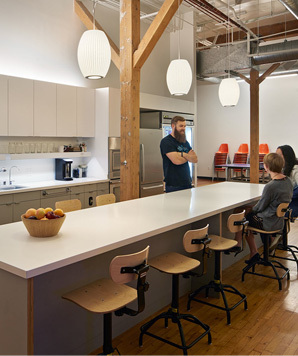 Given the historical significance of the building, special care was needed to maintain its original industrial look, while at the same time create an inviting workspace with modern technology and efficiency. Original brick walls, timber framing and heavy steel fire doors were brought back to life with extensive sandblasting, and seamlessly integrated with modern lighting, kitchen area, interior glass, full electrical and data upgrades, and precisely climate-controlled in-house server room.